"FatCow" Reviews (Apr 2019) - Why 4.6 Stars? FatCow is one of the very best budget web hosts you'll find. They offer great hosting features and server performance for a low price. If you are searching for a cheap, reliable web host, FatCow should definitely be on the top of your list. “Having some of the most affordable shared hosting out there, plus plenty of extras, warrants FatCow be on our list of top web hosts overall. Their customer service, performance, and focus on environmental responsibility leave you feeling good about yourself and your website. Though their hardware isn’t super modern like some of the other hosts, speeds are decent and very reliable. 24/7 phone and email support is there for you every step of the way, should you run into any issues. Don’t be fooled by their lower price, their feature-rich offerings are adequate for many users, particularly first-timers. Website builders with eCommerce and a free domain get you started quickly and easily; unlimited disk space, bandwidth, and emails give you room to grow. “FatCow is one of the better budget hosts out there. They offer great hosting features and server performance for a low price. They are also the feel-good host of the list, with a cute, pun-filled site running 100% on eco-friendly wind power; however, don’t for a second think they aren’t serious about great hosting. New users will love the inclusion of a domain name, unlimited email addresses, and a website builder with eCommerce support. Included integration with popular merchant accounts get you one step closer to selling online. All of it is wrapped up nicely in a simple-to-use control panel, cPanel. 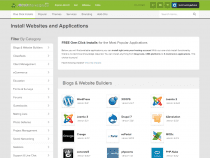 All users will love what they call the "Script Barn," which allows for 1-click installation of popular open-source apps and scripts like WordPress, Joomla, phpBB, and more. “If you want maximum performance and security for your site, and a host with a customer- and environmentally friendly company, FatCow should be at the top of your list of prospective web hosts. When it comes to dedicated hosting features, FatCow has what you should be looking for: two to four CPU cores, 4GB to 16GB RAM, tons of bandwidth, and tons of mirrored storage. They also offer all these things at a very fair rate. “FatCow offers very customer-friendly VPS plans with a lot of storage for the price. If you are looking for a reliable host, with great support and a lot of disk space, give FatCow a serious look. FatCow’s VPS plans are all fully managed and come with cPanel for ease of use. They take the hassle out of installing software like Apache and MySQL and handle the hardware monitoring for you. We also appreciate the plethora of pre-installed scripts. Arguably the most feel-good host on our list, FatCow’s datacenters and offices are 100% powered by eco-friendly wind power. They also want the best for their clients' sites and do not penalize with overage charges, should your site exceed its limits. “FatCow is a good, budget-minded option for those looking to host their WordPress site. With two choices (WP Starter or WP Essential), you can choose the hosting package that best fits your budget. With either plan, you are offered a free domain, plus unlimited transfers and disk space, which is nice. Their WP Essential plan, the more expensive of the two plans, benefits from an all-SSD infrastructure, which provides greater speeds than their WP Starter package. Enhanced security from SiteLock is also added, which virtually eliminates malware. 24/7 phone support is included on this plan, so if you find yourself needing a little help now and then, I would consider this package over WP Starter. For the brave or the capable minds on a budget, the WP Starter plan may work for you. Though lacking some of the extras and support of the bigger package, their WP Starter plan is one of the least expensive WordPress hosts you can find. Both plans come with pre-installed plugins and curated themes to get your site up and running sooner. “Aimed at the low-budget customer, FatCow gets you online in only a few minutes for only a few dollars. While pretty limited at their lowest price, if you need a very simple website with only a few web pages, it’s hard to argue with FatCow's value. Using the CM4All drag-and-drop website builder, you can get a site online pretty quickly. Though their base plan is limited to only six pages, their other plans, with more support, are still very reasonable. Each plan comes with a free domain name, which saves you the trouble of purchasing one separately and waiting for name servers to propagate. For those looking for a little more, FatCow offers support for popular blog and CMS software such as WordPress, Joomla, Drupal, and others. Integrated galleries and forums are also available. Finally, FatCow give you advertising credits towards sites like Google, Bing, and Facebook to get the ball rolling on your site’s exposure. FatCow has many beginner level tools for getting your site up and running. From drag & drop site builders to easy eCommerce setup to marketing assistance. A novice will have little trouble getting a great site up and running quickly. FatCow often offers promotions, coupons, and special offers to customers during their initial term. You can find these deals on the FatCow site itself as well as reputable coupon sites. All sign-ups come with 24/7 phone, chat, and email support, a free domain registration, and an anytime money-back guarantee. FatCow comes with an extensive online help center and ticketing system, plus step-by-step tutorials for using your account. They provide 24/7 phone, chat, Twitter, and email support with calls answered in about a minute. Their staff goes through rigorous QA testing. Plus, feel safe with an anytime money-back guarantee. Wondering how FatCow stacks up againt other web hosting services? See our host-vs-host reviews below and compare them side by side. 1 out of 4 times. FatCow hosting customers get unlimited everything: disk space, bandwidth, databases, domains, and email addresses at those domains. Plans include an easy-to-use site builder, online store, and marketing tools as well, so you can launch your blog, professional website, or eCommerce site with ease. Customizing content is easy, with installs for your choice of CMS, forum, or photo gallery, too. All in all, FatCow is great for first-time users or those looking to grow, and the team is always there to help you when you need them.